Been away a while, very busy, yada yada. What’s Harribobs — a name new to the Listener setters’ world — got on offer for us? Well, there is no sense in pretending that it took me a while to guess the theme. The preamble — with its reference to generations, mathematical rules and some six-letter name for the creator — put me instantly in mind of Conway’s Game of Life. And so it proved, although for all that the gridfill turned out to be quite fun. 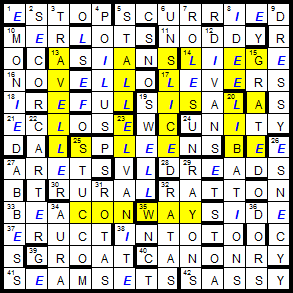 Extra letters from wordplay is a bit of a standard in these sorts of puzzles, but the clues were fair and unambiguous. A couple of elegant ones too: 4dn “French soldiers plunder America” ([s]poil+US), and 8dn “A notion that is almost profound” (i[e] + dee(p)) being my particular favourites for their crisp surfaces. So, an unambiguous and well-crafted ending, and nothing to worry about. Except… well, unfortunately, the instructions tell us to shade the second generation, but the start position in Conway’s game of life is called the seed, or Generation 0. So one iteration would give us the first generation, not the second. An oversight by Harribobs? Or are we meant to highlight the true second generation, the one after the arrangement LIFE? It looks a lot less coherent, but as many point out it’s strictly the correct solution. Ah, well. I’m sticking with LIFE and be damned. Those who haven’t played around with the Game of Life are well-advised to try to. This entry was posted on 6 November 2015 at 4:01 pm	and is filed under Solving Blogs. Tagged: Conway, Game of Life, Harribobs. You can follow any responses to this entry through the RSS 2.0 feed. You can leave a response, or trackback from your own site.